My work week started out pretty stressful. I had to miss my Tuesday night hula class and rehearsal. I needed to take my mind off work. I decided to do a little cooking, something simple. I was not really in the mood for more beet soup. 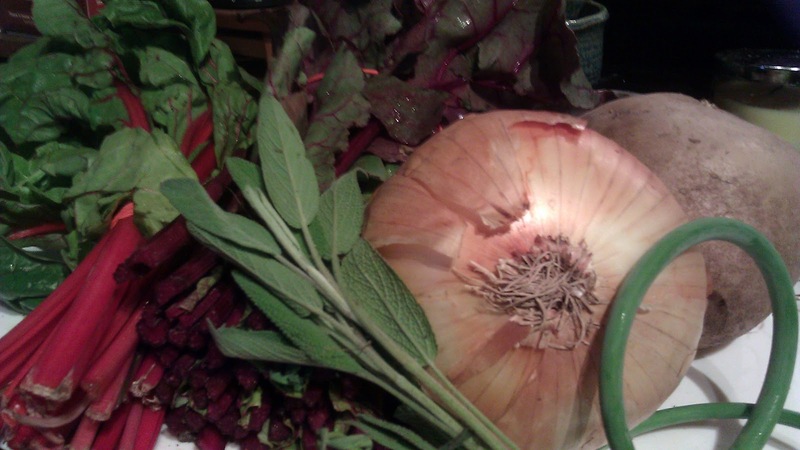 I also still had a bunch of kale left from the CSA share a week ago… hmmm what could we do with that? Here is a vegetarian weeknight one-pot meal. It’s pretty simple and quick. 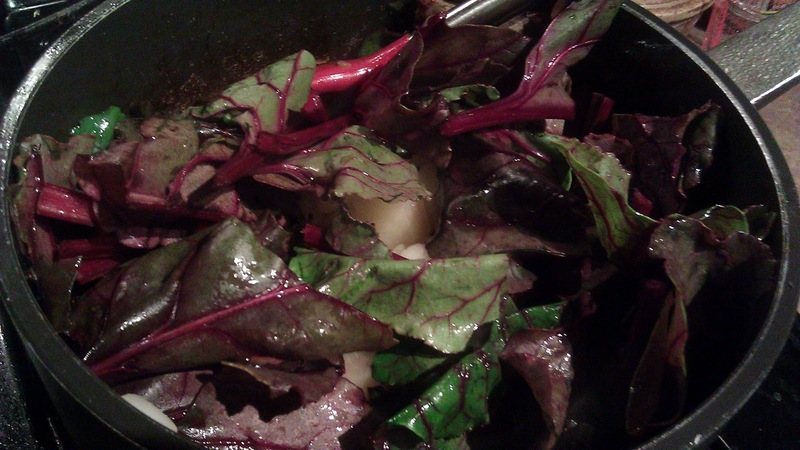 Beet greens, Swiss chard and balsamic vinegar work well together. 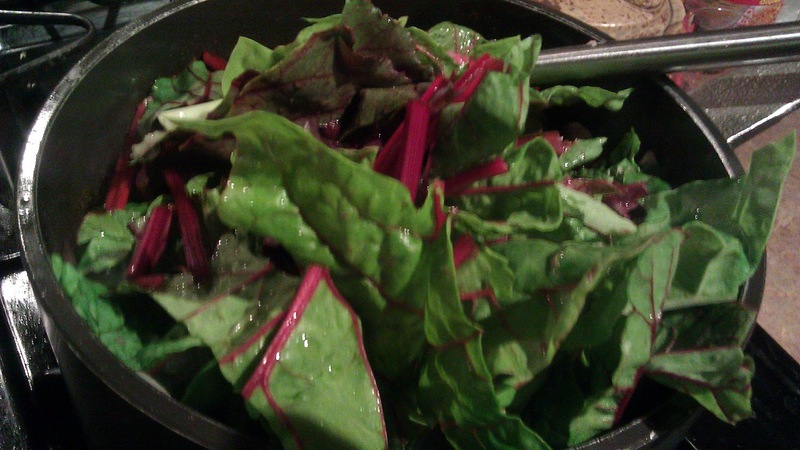 The Swiss chard also adds a little green to the dish when it is cooked, a nice contrast to a mainly red color dish. The Vidalia onion adds sweetness and the potatoes help thickens "the sauce" and give the dish a comforting hearty feel. You can add meat, such as some cut up rotisserie chicken if you preferred. 1 small bunch of Swiss chard – Wash and rinse thoroughly for a few times, roughly chopped in the same size as the beet greens. About 2.5 cups. 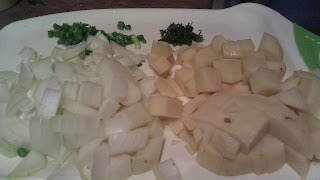 1 large potato (or 2 medium size one), washed, peeled and cut into ½” cubes. About a cup. 1 large Vidalia onion, clean and chopped into ½” pieces. In a medium size pot. Heat 3 Tbsp of ghee or butter till hot. This is more butter than I would usually used. You need the fat and the flavor in this dish. 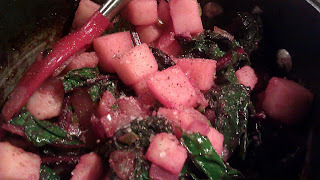 Add chopped scape or garlic and sauté for about a min. Add onion. 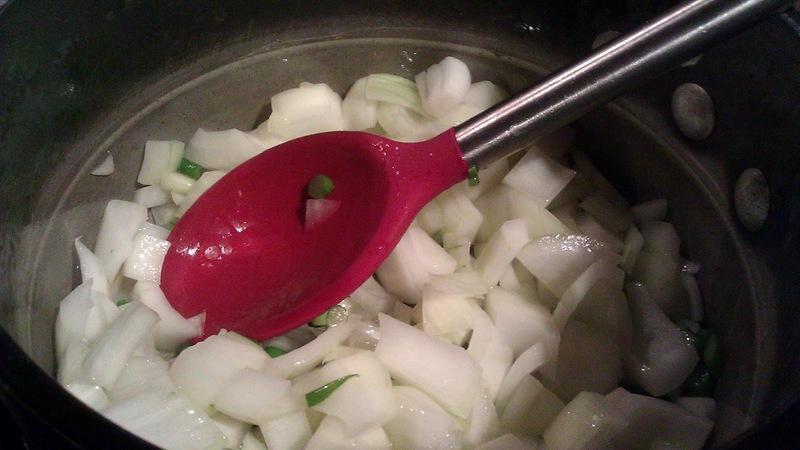 Cook till onion is lightly caramelized. Add potatoes, mix well. Brown potatoes for a few mins. Lower heat to medium low. cook for about 5-10 mins till potatoes are cooked. If you are using a regular pan, the potatoes will stick a little. Not to be too concern, Season with salt and pepper. 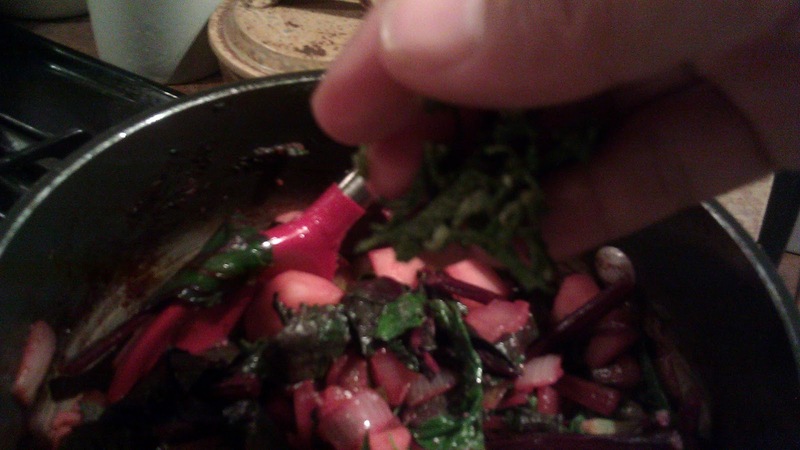 Add chopped beet greens, mix well. 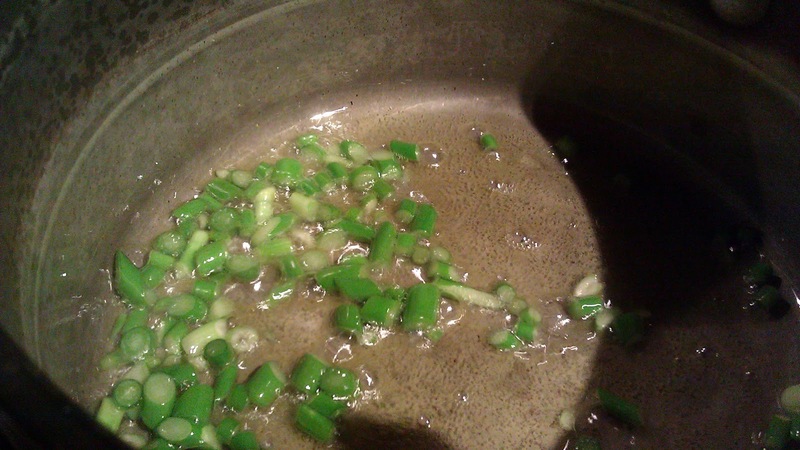 Cook for a few mins till the green wilt. 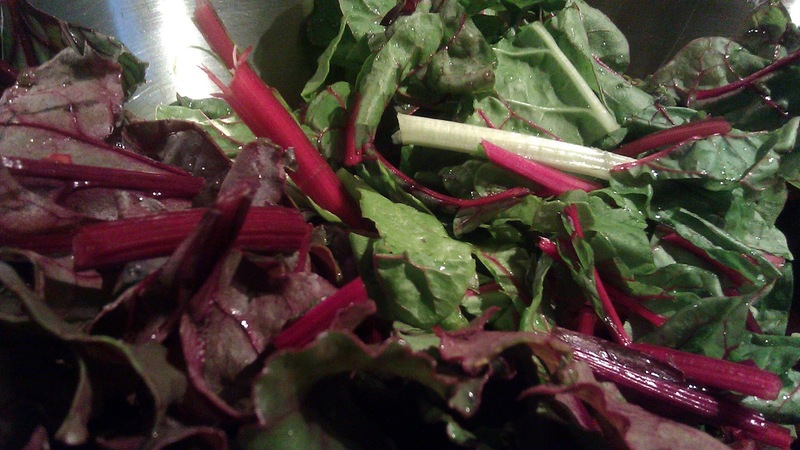 Add chopped chard, mix well. Let the stew cook for about 5 mins till the stems are tender. 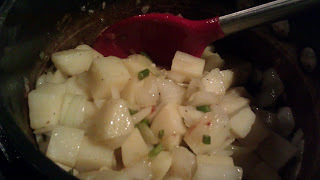 Potatoes bits will thicken the “sauce” lightly. 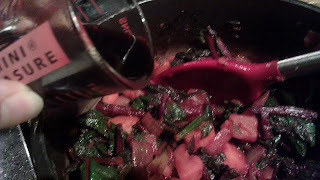 Drizzle in 3 Tbsp of balsamic vinegar. Mix well. Season with salt and pepper to taste. Heat thoroughly for about a min. Plate as main course or side. 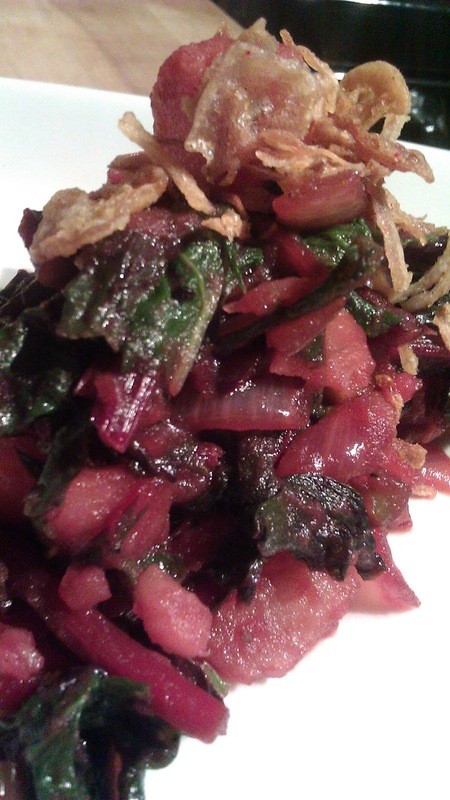 Top with a Tbsp of fried onion just before serving. Interesting dish. I love one pot cooking cause i hate doing dishes lol. I never ate beets back home my mom liked it from the can so i never saw the tops. I too find cooking relaxing and creative. I love your blog girl, as always keep it up!